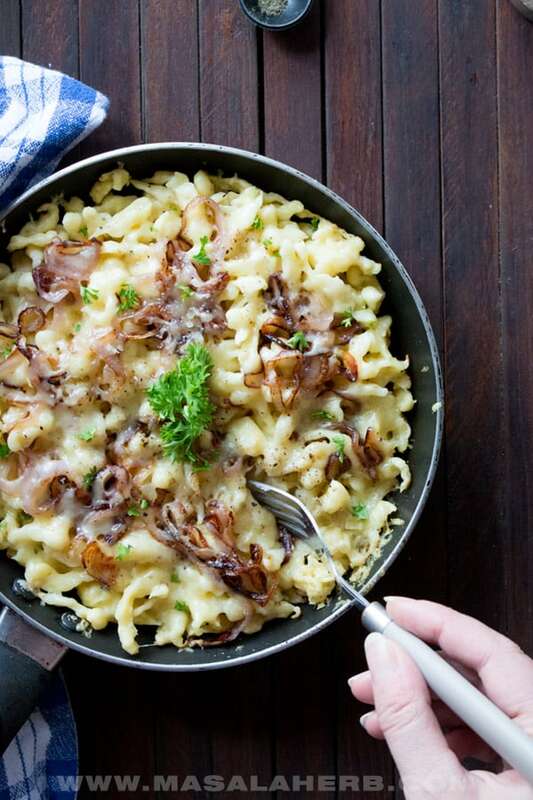 Cheese Spaetzle are noodles prepared and cooked from scratch and fried crispy with caramelized onions and topped with a strong melting cheese. This standalone dish in a frying pan is a common sight in Austria and other German-speaking countries. However, Cheese Spaetzle, aka Käsespätzle in German or Kasspatzl in dialect, makes a bigger appearance in menus in the alpine tourism centers. So, you might know this particular spaetzle recipe from your last holiday to the mountains to Tyrol Austria! But you can make Cheese Spaetzle easily at home too and bring the alpine flair into your kitchen! If you have been following me, you will have come across my recent spaetzle post with the how to make spaetzle video. Find the full printable recipe for Spaetzle here again. 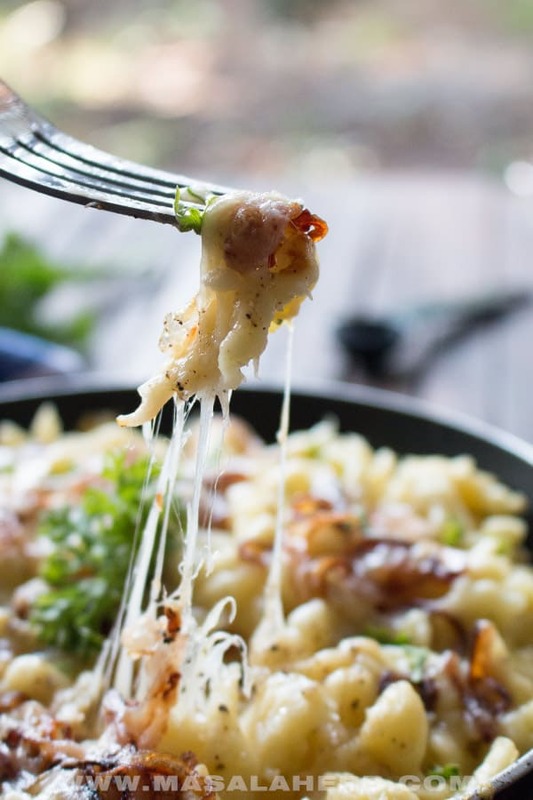 Cheese Spaetzle are the cheesy version and a recipe extension of the plain spaetzle noodles. As simple as this may sound, which it is, cheese spaetzle is a dish on its own and presented that way all over the alpine zone. That means Cheese Spaetzle is just one of the many different spaetzle dishes! In time cheese spaetzle turned into something like an apré ski meal or hotel menu dish for tourists. Yet, Cheese spaetzle are still prepared in local homes alike in Austria, especially in the Alps, where it is better known as Käsespätzle (Käse means cheese in German) or in our local dialect as Kasspatzl. These also make an appearance in Switzerland, however, spaetzle are called Knöpfli in Switzerland. By the way, Spaetzle or Spaetzli is the plural for Spatzl. The word itself derives from Spatz, which is actually a bird. Read more about the word origin on the main Spaetzle post. How to make Cheese Spaetzle? To make Cheese Spaetzle from scratch you will need to make a batch of the easy Spaetzle Recipe first. Usually, what most of us do in Austria, is we make a big batch and freeze the rest of the spaetzle in portions into vacuum bags. So, in the future when you are running late you just need to take out a bag of frozen spaetzle, wait for them to defrost and use the spaetzle further to prepare cheese spaetzle. For the ingredients, you need to actually just make sure to pick a flavorful cheese. The cheese is everything in the cheese spaetzle dish! 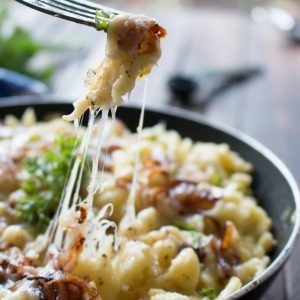 The cheese defines the flavor and makes the cheese spaetzle recipe! 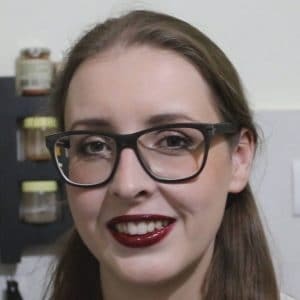 So, you will want to get a cheese which is flavorful, something like a strong Emmenthal, Cheddar or even Gruyere or Raclette cheese. The choice of cheese is up to you and it’s, of course, a preference story. Often while we tend to use a flavorful and strong smelling mountain cheese or a beer cheese. These are local cheese varieties in the Austrian Alps. Some cheese varieties from the mountains are so-called würzig, which means the cheese has a sharp taste, it’s full-bodied and that is what we want for our cheese spaetzle recipe! Then, of course, the onion is another major flavor giver to the cheese spaetzle recipe. A white mild, not too sweet, onion is most suited and the onion should be cut into thick slices or rings. Then the onion slices need to be caramelized and fried in butter so that they get a bit crisp and attain a gorgeous golden brown. You need to make sure to toss the Spaetzle in butter. Not margarine, not olive oil, it has to be butter to achieve the authentic flavor of a cheese spaetzle meal. I also believe that the right pan can make a difference. In older times Käsespätzle would be prepared in heavier cast iron type pans, so the spaetzle would get all the crispier and acquire another flavor. Also in older times, and this was mostly before 1970, cheese spaetzle were prepared in bigger skillet pans for the whole family. The pan with the cooked spaetzle would then be placed in the center of a roundtable. Then each of the family members would sit around and eat from the pan directly with a soup spoon. This is how cheese spaetzle was meant to be eaten, originally. Back then Butter was usually prepared by the farmers as a luxury commodity, which was resold but rarely used in their own cooking. Farmers would rely mostly on the cheap margarine for their cooking. In time things changed and dairy products have become very cheap. DW talked about the dairy pricing problem recently. This is why butter is considered a great flavor giver in the local cuisine of the Tyrol region and neighboring regions in Austria. Cheese spaetzle are easily prepared from scratch if you have your spaetzle ready. Best is to prepare my base Spaetzle recipe with a spaetzle press and to freeze a batch for another day. That batch can be defrosted and used anytime to prepare a quick and easy cheese spaetzle meal. The recipe is for one person and the cheese spaetzle are prepared and served in one small pan. This is how it is served in the apré ski places in the Alps. Yet you can double the recipe easily to serve for 2 or even the whole family. for that just add more onion and cheese. Cut your onion into bigger slices or rings. Heat up a pan and melt your butter. Throw in the onion and fry first translucent and then to a crispy golden brown. Then take out the onion from the pan and keep aside for a minute. Add little more butter to the pan if the pan looks too dry and melt. Then add in your spaetzle and just stir-fry until the spaetzle gets hot. I like to fry mine a little longer so that the spaetzle get crispy in some places. Then season with salt. sprinkle the crisp onion over the spaetzle and finish with the cheese on top. If you used a cast iron pan, you can just place the pan into the oven under the grill setting for a few minutes. Otherwise, keep the pan over the stove on the heat and cover with a lid so that the cheese melts over the. If I had a pan which I can use and place in the oven, I would do that because the cheese doesn't only melt but also gets crispy. In Austria wooden stoves are still common so it's easy to just take the pan from the stove top into the oven compartment of the wooden oven. Serve hot, garnished with some fresh parsley or green chopped chives. Pick a flavorful Cheese such as a full-bodied Cheddar, Emmenthal, Gruyere, Beer Cheese, Alpine Cheese or pick a few assorted kinds of cheese in one pan. Dear Reader, how did you get to know about cheese spaetzle? Please feel free to share with us your knowledge and point of views further below in the comment section! I’ve never made spaetzle, but I’ve always wanted to try. I think you just gave me the confidence I needed! I had Spaetzle for the first time when I was in Austria in December and I’m so glad I found this recipe so I can make it at home! So yummy! I’ve never made spaetzle, but have always wanted to try it! This looks phenomenal! I’m concerned about burning the onions while caramelizing them. What heat setting should I should on my cast iron frying pan? I think you can safely fry the onion crispy with a cast iron frying pan. Just add enough butter or olive oil (butter tastes better in this dish but it’s easier to do it with oil). In case just fry the onion until translucent but of course, it tastes all the way better when the onions are crispy golden fried. I usually always fry on low heat on gas, because I don’t like to burn onions too much. Some people like my grandmother in Austria would burn the onions dark because that’s how they would cook and they enjoyed it that way. But those times during and after the war were different too. I made the dish the same day I posted this. It was delicious. I went with 2 tbsp of butter in total but should probably have cut back a bit since I didn’t have a lot of spaetzle/nokedli. I used old yellow cheddar. 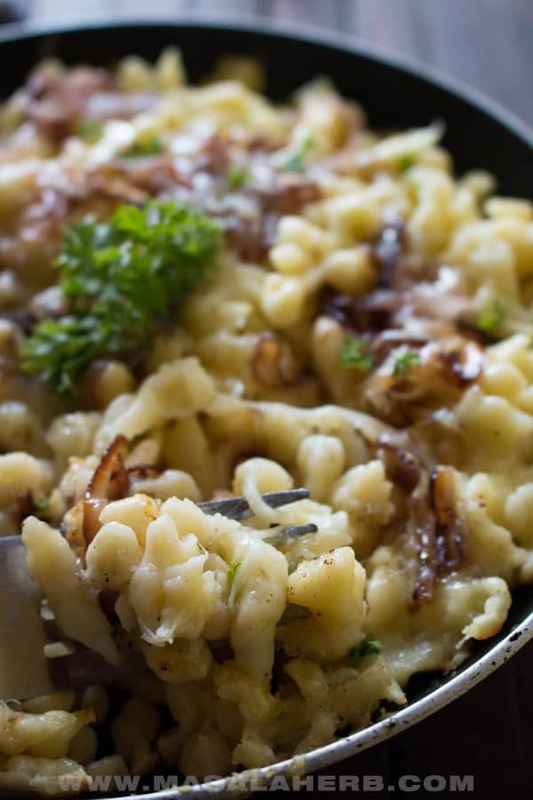 Hi, this may be interesting you: Cheese Spaetzle Recipe - Austrian Käsespätzle!